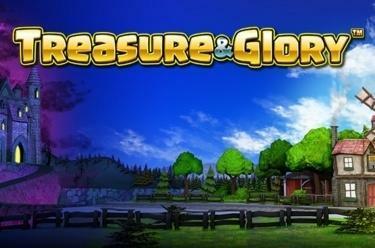 Play Treasure & Glory™ online for free now! Wild Shield: If the Wild Shield lands on the reels it substitutes for any symbol in the game except for the Bonus Hammer that acts as Scatter. However, during free games it substitutes for all symbols including Scatter. Bonus Hammer: 3 or more Bonus Hammers (Scatter symbol) on reels 1, 3 or 5, regardless of the symbols' positions on the reels, trigger 15 free games with a x2 multiplier and a randomly selected Hammer symbol. The huge Bonus Hammer symbol on reels 2, 3 and 4 has the same effect. Large symbols: A large symbol that entirely covers reels 2, 3 and 4 can appear at the beginning of a normal spin in the regular game. If the Bonus Hammer appears as a huge symbol you automatically win 15 free games. 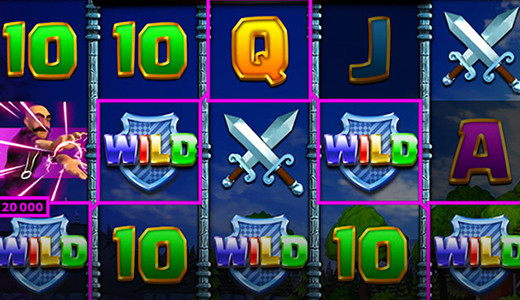 If 3 or more Bonus Hammers or a huge Bonus Hammer symbol have landed on the reels the free games start automatically. Prior to the free games starting a Hammer symbol is selected at random – 10, J, Q, K or A. Every Hammer symbol that appears punches a hole in the wall behind it. If the entire wall has been destroyed at the end of the free games, then you reach the Golden Chamber where you are rewarded with the Big Profits feature. During free games all winnings are multiplied by 2. Big profits: You will find 12 chests in total in the Golden Chamber. Each has a value of 50 to 500 times your total bet that you can win when you open one. Simply click on one of the chests to open. You win its contents, then the feature comes to an end. The evil wizard is plotting behind the castle's walls – but you own the ultimate secret weapon, the Golden Hammer! With this weapon and a little luck you will hopefully succeed in entering the Golden Chamber and snatching the treasure. This is the world of Treasure & Glory™, an exciting adventure with great winning chances. Get going and show the wizard who's the hammer-swinging top dog!